Lake No Lake is a glacier dammed lake that periodically drains under the retreating Tulsequah Glacier. Canadian topographic maps indicate that three glaciers coalesced to fill this valley: Tulsequah, No Lake East and No Lake West. By 1984 when I had a chance to see this lake had formed while working on Tulsequah Glacier. Here we examine the retreat of the three glaciers that has led first to lake formation and now to a reduction in lake size from 1984-2013. 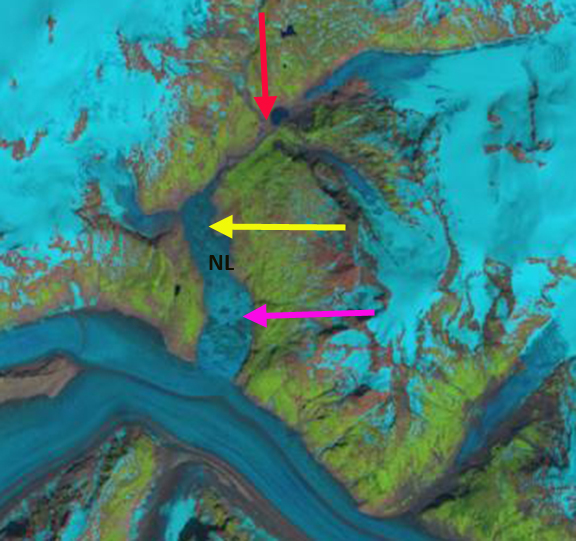 In 1984 the lake extended to the terminus of No Lake East Glacier at the red arrow, after that glacier separated from the other two. Most of the valley below this point is filled with the Tulsequah and No Lake West Glacier that are still connected. The retreat of No Lake East is 1.75 km and now filled by a lake. A series of five Landsat 8 images from 2013 indicates the progression of this lake during a summer. 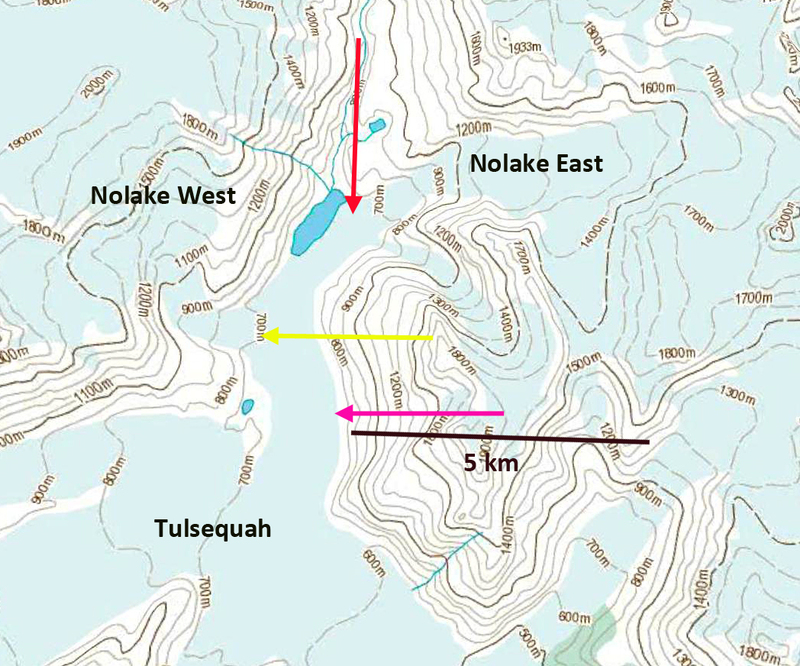 On June 14, 2013 the No Lake East Glacier and Tulsequah Glacier are now separated with a valley 2.5 km long in between. This segment of the valley is filled by the lake, but the lake does not extend upvalley from West to East No Lake Glacier. 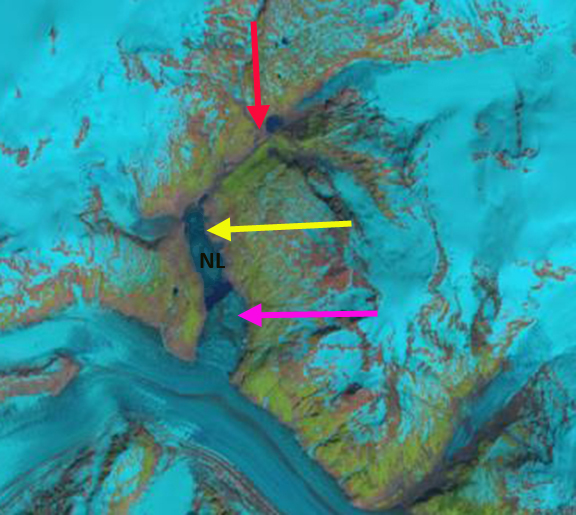 By June 21 the lake has extended another 400 m upvalley to the northeast as the lake fills. By June 30th the lake has expanded to a length of 3 km and an average width of 600 m. By August 1st the lake has largely drained, though there are many icebergs still on the lake bottom and there is certainly some water remaining. By September 28th the lake is completely drained. 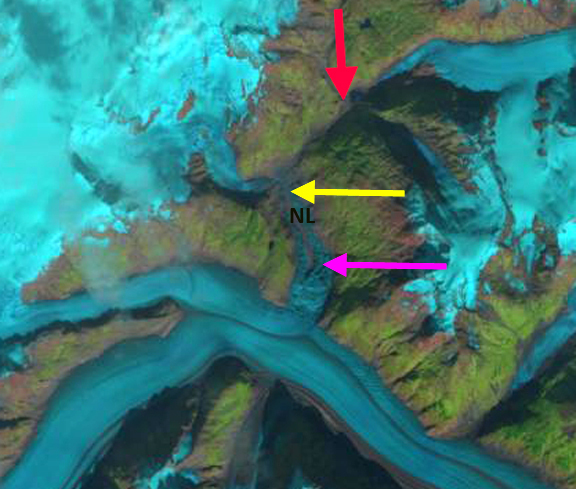 The retreat of No Lake East Glacier from the 1984 terminus location at the red arrow is 450 m. The retreat of No Lake West Glacier from the yellow arrow is 400m. 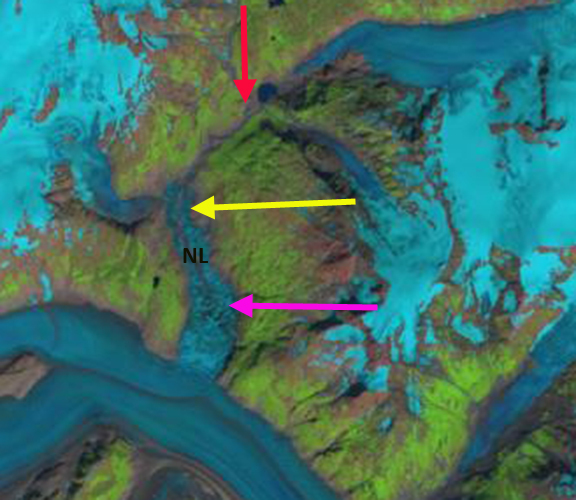 The 30 year retreat of the arm of the Tulsequah Glacier from the yellow to the pink arrow is 1800 m. As the damming arm of Tulsequah Glacier continues to thin this glacier will continue to decline in both depth and area. 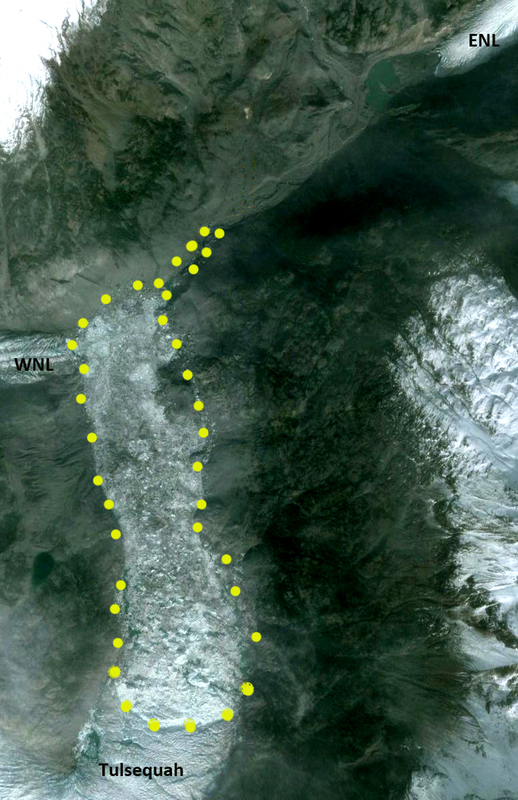 A 2010 Google Earth image is used to indicate the lake margin as indicated by stranded icebergs after drainage. 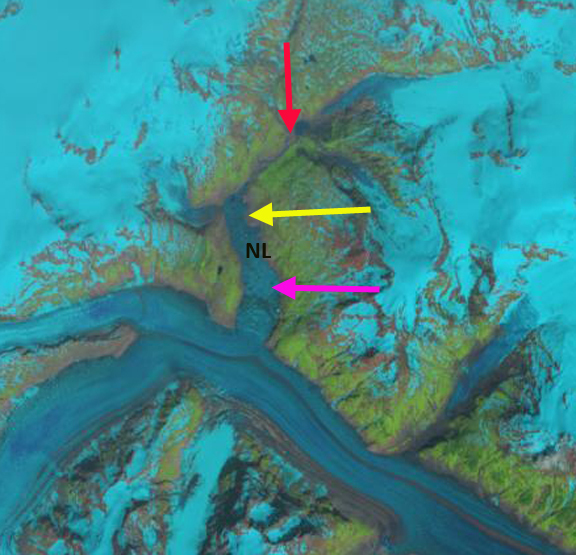 Geertsema and Clague (2012) observed that this lake grew rapidly and began having glacier outburst floods during the 1970’s, but is now declining in size. 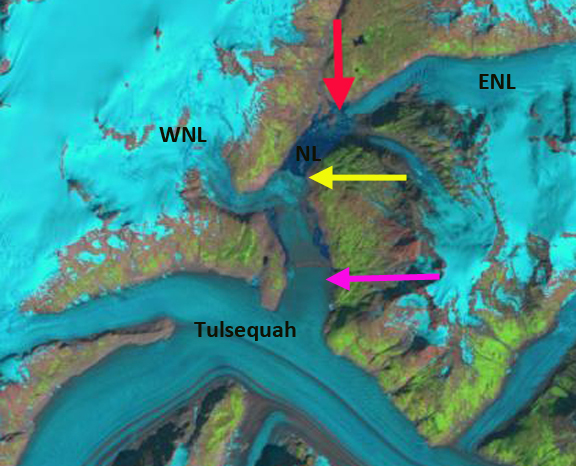 This entry was posted in Glacier Observations and tagged glacier dammed lake, Lake No Lake, No Lake Glacier retreat, Tulsequah Glacier Retreat. Bookmark the permalink.